After polarizing pop radio with her “Dirrty” track, which peaked at #2 on my own chart, Aguilera released this ballad with the Linda Perry touch and all was forgiven. Coming off a three-week run at #1, this was her last solo chart-topper to date. All five of the single releases from her 2002 album Stripped ranked in my top 5, which remains her biggest album in terms of total number of entries. There was “No Such Thing” as one-hit wonder status for Mayer (see what I did there?) as the second single from Room For Squares took shape as a moderate radio hit. He wrote the song about his first girlfriend at age 14 and it was initially titled “Strawberry Wonderland” before the change to its published title. The performer’s had his ups and downs on the charts — he last made mine in 2012. In 2001, the Missouri rockers began a run of big hits on the Alternative chart, including the 2002 crossover hit “Blurry”. By 2003, they found themselves with another rocker on the pop airwaves, an angsty anthem about songwriter (and one-time band member) Jimmy Allen’s ex-girlfriend at the time. “Hates” got as high as #2 on my survey, which remains their biggest and last song to enter. After *NSYNC‘s hiatus in the summer of 2002, its two lead singers went solo. 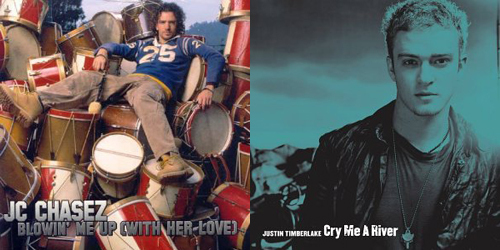 Justin Timberlake will be coming up later on the countdown, but at #7 was the first solo hit for Chasez, first featured on the soundtrack to the movie Drumline and then on solo album Schizophrenic. This was his biggest solo chart hit, peaking at #6 the next week, while fourth single “Build My World” went to #13. Originally recorded and released in 1970 by singer-songwriter Joni Mitchell, “Yellow” charted under three different acts including Mitchell (as well as The Neighborhood in 1970 and Amy Grant in 1995) before touching the radio airwaves in this duet version. A big single on the Hot AC survey, it was also one of their last CHR hits, and racked up a few weeks in the runner-up slot on my top 40. Back-to-back remakes in the countdown, although this one was about to experience a plunge on the national charts several weeks later after lead singer Natalie Maines made her infamous comments about President Bush. The Fleetwood Mac cover was their one song to crossover to CHR radio thanks to a remix by Sheryl Crow. On my list, it peaked at #4 for two weeks in February before falling. He could be picking up a few GRAMMY statuettes tomorrow night, that is, if he actually attends the show. (He reportedly turned down an invite to perform on it.) “River” was inspired by Timberlake’s relationship with pop star Britney Spears, and the music video went so far as to cast a look-alike in it. Whatever side you’re on, we can all agree it was a hit, and that’s not worth shedding any tears over. She was all of 18 years old when this was a hit, but the Canadian born singer was having a monster debut album with Let Go after two #1 singles on my chart, “Complicated” and “Sk8er Boi”. This single was as its peak. Unfortunately, the performer hasn’t exactly shed her teenage image since and her peaks have suffered: her last leadoff single, 2013’s “Here’s To Never Growing Up”, just missed my top ten. This was her… then. The R&B duet from the Bronx native’s last multi-Platinum album to date was another big hit, and the two worked so well together that in 2006, they teamed up again on the rapper’s hit, “Control Myself”. Lopez is currently teasing a promo single from her forthcoming album titled “Same Girl” and judging along with Harry Connick, Jr. and Keith Urban on TV’s American Idol. 2003 was a big year for this pop punk band, just a few months after the release of their second album, The Young And The Hopeless. There was one particular girl in my grade who had a huge crush on the two brothers, Benji and Joel Madden. I’m guessing she was over them by the time high school started. Anyways, the quintet had three top ten singles on my survey during the era, this one spending four weeks at #1. Only one single from their next album charted, “Predictable” (#17), and they haven’t been on since 2004. Check back next Saturday for another Adam’s Top 40 Flashback and don’t forget to follow the blog by using the tab below or find PGTC on social media by clicking the “Get Social!” tab at the top of the page.